Everyone knows that TV shows like to tackle topics that are hot button issues, and Grey’s Anatomy has been no different over the years. This season alone, the show has tackled domestic abuse, terrorism, police bias, and transgender issues. Grey’s Anatomy has never taken a strong political stance until now: the latest episode delivers a big-time plot and response on immigration. The majority of the episode focuses on an ICE agent arriving at the hospital to find intern Sam Bello. I figured that it wouldn’t be obvious who was in potential trouble, but it was quite surprising that Sam was. Sam tells Bailey and Meredith that she is in the country legally under DACA with working papers, as she immigrated to the United States from El Salvador as a baby. Her dreamer status is in jeopardy because she ran a red light. Both Sam and Andrew spend a lot of time freaking out about what to do. Sam clearly isn’t a criminal and doesn’t deserve to be deported over running a red light. This storyline is an obvious response to the current tumultuous political atmosphere, but it is rather interesting that they took a passive route of a very small “crime” to create an impactful plot. Bailey and Meredith do everything they can to stall the agent and figure out how to keep Sam safe — respectively — with varied responses. Bailey winds up saving the agent’s life when she notices his pulse pounding through his jugular vein while he is waiting for Sam in her office. The agent agrees to having an EKG at Bailey’s request, which shows that he has an irregular heart rhythm. Bailey calls in Maggie, who finds that the agent has blocked arteries that are unclogged in the cath lab the same day. While in surgery, the political stance thickens as the agent tells Bailey that he doesn’t believe he is always doing the right thing going after innocent dreamers. Meredith pulls some strings and gets Sam a surgical residency spot at the hospital in Zurich, Switzerland that Cristina Yang is currently working at. She also gets Sam a plane ticket to allow her to leave the country voluntarily and immediately. Sam decides to run because she is too afraid to face the agent and potentially be deported. She leaves the love of her life, Andrew, behind and won’t allow him to follow her. This appears to be a goodbye to Sam, as it is unlikely that she would come back to the country if ICE is after her. It is an odd way to get rid of a character and is an unexpected potential exit. For those not involved in the immigration events, there were plenty of other interesting cases going on. Alex and Amelia’s young patient Kimmie, who has the inoperable brain tumor, decides that she is going to leave the hospital to enjoy the limited remaining days she has left. Alex pleads for her to stay a little longer to allow Amelia to try and find another surgeon to do the ultrasound wave surgery. Amelia finds a surgeon in Chicago doing similar research, but when she hears that Amelia works for a Harper Avery hospital, the surgeon hangs up and won’t discuss the matter further. The other surgeon has some legal document saying that she can’t talk about something that happened with research and Harper Avery, which sounds super sketchy. Amelia asks Jackson to talk to her about it to see if she will reconsider helping Kimmie. Again, the surgeon hangs up and won’t discuss the truth. Jackson asks Catherine if she knew anything about this surgeon, but Catherine doesn’t disclose the truth either. Catherine makes a huge mistake in not telling Jackson what is going on because she is very upset when she finds out that he has gotten the legal agreement dropped. Catherine acts as if her whole family is now dead because of what Jackson has done — not that the audience gets to know what the deal is. She tells this to Richard as he is coping with the loss of his sponsor, Olive. There’s a lot more to this story that will definitely be impacting the show in the near future. 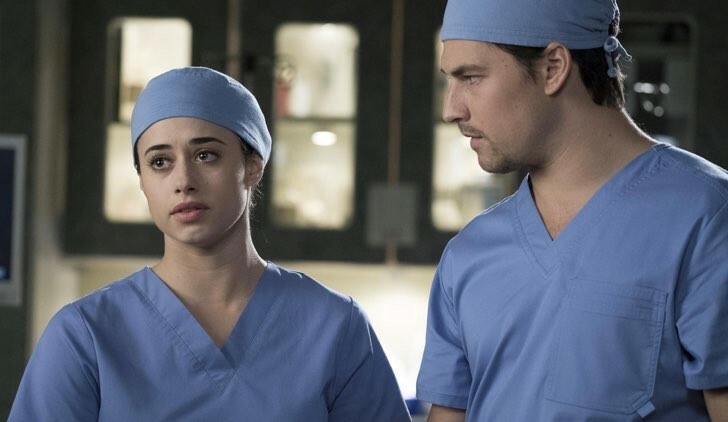 Amelia and Jackson weren’t the only ones unhappy with Kimmie leaving and not getting her help: Alex is beyond upset that he couldn’t save his patient. Jo tries to soften the blow by kicking off their wedding planning and telling Alex how she wants to have kids with him. She goes on to ask him if it would be all right for her to take his last name when they get married because she has never had the last name of someone who loved her. I don’t know how anyone could not be tearing up at this beautiful moment, which is the most genuine scene of the episode. Elsewhere, Arizona is freaked out when Matthew Taylor brings his baby into the hospital. The baby isn’t doing well and has some unknown issue, plus Matthew has tons of trouble coping with being at Grey Sloan and in the same room as Arizona, following the previous passing of his wife. While April was able to fix herself in the last episode, Arizona is still troubled. She asks Owen to take over the baby’s care at Matthew’s request, but it’s April’s eavesdropping that leads to a diagnosis. April’s diagnosis saves the baby and reconnects her with Matthew. However, her comment to Owen about how he wouldn’t think to check for certain problems because he doesn’t have kids seemed to hit home. Owen fills out papers to foster a child with the intention to adopt at the end of the episode, which is a great moment for him. Owen has wanted children forever, so it is nice to see him starting down the path to happiness. Arizona is still having trouble coping with losing Matthew’s wife weeks ago and overreacts with all her patients. She goes so far to have intern Schmidt put together a special OB/GYN crash cart so they can be properly prepared for one of their patient’s potential complications. While they don’t need the cart for the intended patient, they do use it to save the life of another patient. Carina tells Arizona that the crash cart is a brilliant idea and that this could be the way to move forward with their project and save more lives. It is a great idea, so hopefully this pulls Arizona out of her funk.